As some of you will know, I have been on-and-off of all four of Labour’s National Committees since 1981 and I have been present when some very important decisions have been made. But in some ways, this NEC was very special. I think am not exaggerating when I call it historic. It was historic for several reasons. Firstly, Jeremy, my friend of 41 years, was now in every way the full leader of our Party. Secondly, for the first time since the Labour Party was formed, the CLPs and Party Members were properly treated as one of the two pillars of our party – the political wing and the industrial wing. Thirdly, the mood at yesterday’s meeting was significantly changed from when Jeremy was elected. It was clear that everyone who came to the meeting was ready to come together behind Jeremy. I have to say my old sparring-partner Tommy Watson was one of the central figures in creating this more positive atmosphere. The other, of course, was our very special chair Glenis. When I arrived, the media were busy laying siege to the building – they had been told this NEC would be reminiscent of some of the vicious battles of old. They were trying to interview NEC members as we entered, but somehow I am rarely approached. It could be because I wear a sloppy-joe jumper and carry a co-op bag – not their image of an NEC mover & shaker! In fact the meeting – nearly 7 hours long, with Glenis firmly in control – was as still as a millpond. Of course, I couldn’t resist throwing the occasional stone into the millpond, but it didn’t create the usual reaction. Finally, I would like to pay tribute to everyone at the meeting, including all of the staff whose attendance was much greater than usual, for their contributions to what I am determined to call an historic moment in our Party’s long and proud history. Jeremy opened by paying tribute to some friends and comrades he and the party have lost – Nigel Beard, the son of a railway porter who managed to win Bexleyheath in 1997; Kevin McNamara, who Jeremy told us he had been very close to for many years. Jeremy drew attention to Kevin’s unstinting work for the Northern Ireland peace process. Jeremy then told us about the outstanding record in the Labour movement of the NEC’s very own, late Mary Turner. When Jeremy was a NUPE official in the early eighties, he often battled on behalf of school meals workers and other low-paid staff, along with Mary, the doughty comrade from the GMB. In 1997, Mary was elected as GMB president and re-elected every year since. Mary served on the NEC from 1995 and everyone around the table had fond memories of our comrade. Jeremy then wholeheartedly thanked Kezia Dugdale for her major contribution at a key time in our ongoing campaign to regain those working-class seats where the Labour Movement and our Party first took root. We made considerable gains in Scotland at the General Election, and Jeremy has been criss-crossing the country to make sure we build on these in the future. It is already clear that the SNP bubble is deflating rather rapidly. It was agreed to send Kez a letter of appreciation from the whole NEC. Jeremy then took the NEC through the rather convoluted Brexit negotiations – made much more convoluted by the naive and ill-prepared approach of the Tories. Our frontbench, and the whole PLP, are pulling together to make significant interventions on the floor of the House of Commons. Jeremy outlined the tactics and strategy that we are employing in Parliament to disrupt and derail the Government’s stumbling and inadequate modus operandi. Jeremy then covered the concerns of the whole party about mushrooming abuse of politicians – especially female politicians – on social media. Jeremy and the whole NEC particularly deplored the egregious abuse suffered by Diane Abbott. The Government must do more to address this appalling situation, which is in danger of getting completely out of hand. Jeremy made it clear that this would be a priority of the next Labour government. Jeremy then gave details of his action-packed campaign of rallies and meetings throughout the summer, especially in those seats which are Tory marginals. Jeremy had a particularly warm welcome in these latter constituencies. The whole NEC recognised that the lead Jeremy takes on campaigning is particularly inspiring to our members and to the public. I privately told Jeremy that it was rather reminiscent of Gladstone’s Midlothian Campaign. But I told him we can do without a ‘Corbyn Bag’. Jeremy then took the NEC through the very serious humanitarian crises that are sadly deepening. He outlined the appalling way the Rohingya Muslims are being treated by Myanmar, and the major problems this is creating for the Bangladeshi government. Jeremy of course acknowledged the overwhelming power of the military in Myanmar, but emphasised that much more could be done to ameliorate the crisis. In the Yemen, the humanitarian crisis is deepening by the day, and Jeremy deplored the continuous Saudi Arabian bombing, and the way the British Government is effectively supporting the Saudis by keeping their head down and selling weapons. In fact, a significant number of Contemporary Motions from CLPs deploring the Saudi actions have been submitted to the forthcoming Annual Conference. Unfortunately, the CAC for some puzzling reason has ruled these out of order as not “contemporary”. I would have thought this a rather difficult argument to make; and of course now that the inestimable Seema Chandwani and Billy Hayes have had their landslide victory in the recent CAC elections, we can anticipate that we will not have quite so many puzzles in the future. Jeremy then moved his paper “Party Democracy Review”. Jeremy has asked Katy Clark to lead this comprehensive review. It will regularly report to the Leader and to the Party Chair, Ian Lavery MP. The review will be wide-ranging, covering for example developing democratic policy-making procedures, strengthening the role of CLPs and Conference, and the development of associated regional plans. The democratic function of associated bodies such as BAME Labour and Young Labour will also be examined. Over the last two years, NEC subgroups have been looking at more effective and democratic structures within our party. These will also be integrated into the review. The review will also strengthen our commitment to increasing diversity and gender representation within the party, and empowering our Women’s National Conference. Particular attention will be given to ways of strengthening the links between the party and the unions both locally and nationally so that many more trade union members are fully engaged, and to ensuring more working class candidates take up public positions of office. Attention will also be given to enhancing the accountability of our Local Authority representatives. Jeremy’s Review will organise its own programme of work. It will consult with CLPs, affiliated Trade Unions and other affiliated organisations, the PLP, and individual members. The experience of our sister parties abroad will also be examined. Katy will aim to produce an interim report within 12 months. Glenis divided the reponses from NEC members into two sections. Those concerned with Jeremy’s general report, and those concerned with the Review. Several Trade Union Representatives stressed the need to resolve the industrial dispute in Birmingham before it gets further out of hand. Jeremy comfirmed that he was as far as possible addressing this matter. Several NEC members, especially Shabana and Keith, gave further details of the dreadful examples of social media abuse. It was generally agreed that the party needed to raise their game even further on this matter. I stressed that both the NEC and Annual Conference need to emphasise that the General Election Manifesto must be basis on which our policy will be developed. In his response, Jeremy assured us that our manifestos policies should and will be the basis of our policy development. Turning to Jeremy’s Review Paper, almost every NEC member contributed. Tommy welcomed the paper, and emphasised that every leader in living memory has brought forward party reforms, and he welcomed the comprehensive review. Several members emphasised that special effort must be focussed on the issue of diversity and gender balance, together with more attention to encouraging more working class local and parliamentary candidates. Several NEC members were a little anxious that the review will be portrayed in the hostile media as “distracting”. I responded to this point, but unfortunately someone present immediately texted the media saying that I had spoken about “attacking MPs”. My recollection is that I responded that “of course the hostile media will portray Jeremy’s positive and democratic Review as a ‘distraction’. After all, they are Tory lackeys. I hope Labour MPs will not echo their views. Our membership will rightly note those Labour MPs who go along with the hostile media and I too will make a note of those MPs”. I stressed that it has long been insulting to our members that they only have 6 seats on an NEC of 35. Under Blair they had 7 seats and this was reduced to 6; whereas other sections of the party were given extra seats. Now that our membership has expanded from some 200,000 to some 600,000 there should be no time to lose to increase the membership’s justifiable representation. I said that of course the hostile media would portray it as the Left increasing its power over the poor helpless Right. I pointed out that Jeremy is not sectarian in any way, and therefore the poor helpless Right have nothing to worry about. Finally, Jeremy’s paper for setting out the Democracy Review was carried Nem Con. Tom outlined all of the effective action that the PLP are taking in Parliament; he is focussing on some of the most appalling areas of neglect by the Government, particularly on the dreadful nightmares that the gambling industry are inflicting on tens of thousands. This crisis is getting much worse as a result of the use of the internet. Tom intends to continue to highlight the dreadful impact of these terrible abuses and the way Labour will deal with them, unlike the Tories who pussyfoot around. Tom also complemented Jeremy’s report of the convoluted Brexit negotiations process. He highlighted the areas where the Tories are most vulnerable. In response to Tom’s report, I pointed out that there are many ‘Brexit’ Contemporary Motions on the agenda at Conference. These contain a myriad of different proposals. I suggested that an NEC statement could be produced that would set out the party’s position very clearly, and that the media could not then distort and exploit the issue. Jeremy and Tom responded positively and I am hopeful that this suggestion will be taken forward. The inestimable Harry Donaldson, chair of the Conference Arrangements Committee, then took the floor. Harry gave the NEC an enormous amount of detail about all of the arrangements at Brighton. He covered every possible avenue. The NEC then responded to Harry’s tour-de-force. Darren moved a motion proposing that the rules for the right for constituency delegates to attend Conference should be dated (as far as their party membership is concerned) from the 7th July 2016. Darren’s oratory carried the day, and this means that some 65 delegates will now be able to attend Conference that had previously been debarred, including a delegate from Orkney CLP for the first time since the Second World War. I pressed Harry on two issues. Firstly, the unprecedented action by the CAC such that CLPs moving a rule change at Brighton had to give notice by the ridiculously early date of the 4th August, rather than at Conference itself as has been the case since time immemorial. Harry assured me that the letter may have given the wrong impression, and that the rights of CLPs have not been curtailed in any way. Secondly, I raised the issue of the rule change, carried in the teeth of opposition from the platform, at last years’ Conference, which gave delegates the power to move votes in parts on huge NPF etc. documents, rather than having to vote on a take-it-or-leave-it basis. I pointed out that in his oration Harry seemed to be suggesting that these rights given by last year’s Conference are going to be somewhat diminished in practice. Harry smiled and said that no doubt the Yellow Pages will be taking up this issue. The NEC had before it a detailed paper setting out all of the constitutional amendments for this Conference from the NEC, together with proposed rule changes from CLPs for this Conference and proposed rule changes from CLPs and a Trade Union for next year’s Conference. The first rule change on the paper from the NEC proposed that the CLP seats on the NEC be raised from 6 to 9 and that the Trade Union seats on the NEC be raised from 12 to 13. after a detailed discussion of all of the implications of this rule change, it was carried Nem Con. The second rule change from the NEC proposed that the number of nominations required in the case of a vacancy for leader or deputy leader should be 10% (down from 15%) of the combined Commons Members of the PLP and Members of the EPLP. This was also carried Nem Con. The third motion from the NEC set out how the Party will deal with the issue of discrimination and harassment. After a very constructive debate, this rule change proposal was carried unanimously. Attention then turned to some 27 proposed rule changes on the agenda at Brighton from CLPs and affiliated organisations. The paper proposed that the movers of all of these rule changes should be asked to remit them to the Corbyn Democracy Review process. If any delegate refused to remit their rule change the NEC would ask Conference to defeat the rule change. Ann Black gave a full report of the arrangements for this Conference, and pointed out that it would have a higher profile and greater significance than for some twenty years, and highlighted that for the first time since the last century the Conference will be electing a Women’s Conference Arrangements Committee. The Conference will be electing two reps to sit of the WCAC. Six nominations have been received for these two seats. 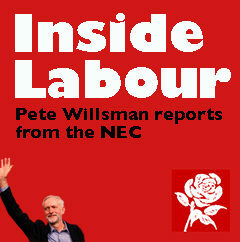 A detailed report was given by Nick Forbes and Alice Perry – please see Alice’s detailed report on LabourList. Glenis moved her written report which had been circulated to the NEC. This outlined the Brexit questions which remained unanswered on such issues as Citizens’ Rights, Ireland, and UK liabilities. The report emphasised that ‘No Deal’ will lead to rather a lot of chaos. Labour MEPs are insisting that the EU standards on fire safety must be maintained after Brexit. Glenis’s report also set out precisely why the UK should follow the EU’s lead and ratify the Istanbul Convention on Preventing Violence Against Women. Finally, Glenis ended on a personal note, as this will be her last written NEC report. Glenis said she was immensely proud of the work of Labour’s MEPs over recent years, and has always been proud of Labour’s outward looking and internationalist approach, and that under Jeremy this would continue. Glenis ended by saying it had also been a great pleasure to serve on the NEC for some nine years. Iain and other senior staff members introduced a very lengthy paper setting out the proposals for “Open” and “AWS” selections. The NEC went through these one by one. I am pleased to report that several AWS were added to the list proposed by the office. I think some 60% of CLPs will be selecting their candidates via AWS. The NEC had before it a detailed paper setting out the timetable for this election, together with a long list of formal hustings events. Nominations for leader opened on the 11th September, and closed on Sunday 17th September. The right to make supporting nominations opened on the 18th September, and closes on 13th October. The last date to join as member, affiliated supporter, or registered supporter, in order to vote in the Leadership Ballot is Monday 9th October (noon). Ballot opens 27th October, and closes 17th November at noon. The result will be announced Saturday 18th November. The NEC endorsed this paper. This comprehensive document, reporting on all of the Policy Commissions’ work, has already been circulated, and is available online. I raised the point that for some 70 years every Conference delegate, every CLP, and also journalists and historians (who found them invaluable) were issued with a book containing a full verbatim report of Annual Conference from gavel to gavel. Sadly, some 12 years or so ago, this significant contributor to our Party’s democracy was unilaterally abandoned. For a few years it was replaced with a video, then audio recording, and finally by seemingly nothing at all. This means historians of today’s party Conferences will have less information than historians of Ancient Greece. Jeremy and I are very anxious that these vital documents are reinstated under our new and democratic regime. Iain responded very positively to my proposal. He confirmed there will be a video from gavel to gavel. I congratulated Iain on this major step forward for party democracy, and indicated that next year I will be pressing for the ‘full monty’. Iain smiled in anticipation, as did Jeremy and I. The NEC discusses the leader’s paper on reviewing party democracy but the rest of us don’t have access to it. Is there a contradiction here? I am very glad that Peter too up the issue of voting on the separate sections of the NPF Annual Report. The response he got, however, sounds far from democratic. Secondly, I raised the issue of the rule change, carried in the teeth of opposition from the platform, at last years’ Conference, which gave delegates the power to move votes in parts on huge NPF etc. documents, rather than having to vote on a take-it-or-leave-it basis. I pointed out that in his oration Harry seemed to be suggesting that these rights given by last year’s Conference are going to be somewhat diminished in practice. Harry smiled and said that no doubt the Yellow Pages will be taking up this issue. How come the NEC could not insist on a straight answer to such a clear and important point? And this was after discussing the party leaders report on improving party democracy! Thirdly, the mood at yesterday’s meeting was significantly changed from when Jeremy was elected. It was clear that everyone who came to the meeting was ready to come together behind Jeremy. I have to say my old sparring-partner Tommy Watson was one of the central figures in creating this more positive atmosphere. I would not get that carried away. They have accepted that there is no way of getting rid of Jeremy. That a third party will not work after their observation of how badly a ‘moderate’ party did. I agree they have been diminished but they are still there. Ann Black’s report on the subsequent NEC meeting (22nd Sept) points out that the proposal to review Labour’s policy procedures makes no mention of the National Policy Forum. I just checked Peter’s report and noted that his section on the review doesn’t mention it either. According to Ann B’s report the report was to be considered by Conference. If it was considered then I would like to know when. The delegates I have spoken to are not aware of it having been presented or discussed. Ann B points out that it is now getting rather late to organised an NPF meeting before Christmas. This raises the question of whether the policy procedures are in the process of being changed by organisational sleight of hand prior to any debate throughout the party. It would be good to have an answer on this from Peter or one of the other left slate member of the NEC. The review will be led by Katy Clark who will be assisted by Andy Kerr, Claudia Webbe ad Ian Lavery. I hope therefore that Claudia can put us in the picture as to what is happening with the NPF? Is it being sidelined before any decisions have been made? Everything could be in the Review,incl.at least 3 kitchen sinks.Best,P. Peter, when we put questions to people elected on a left slate to represent members on the NEC is it not reasonable to expect something more informative? David, sometimes you are exasperating. What could be more informative than ”everything”. What is there beyond everything? In due course it will be reduced from everything, but idc has not yet come. So go with everything for time being. Peter, thank you. That gave me a really good laugh. Sorry to have been dissatisfied with the low informational content of a promise of “everything”. Now I will contemplate the potential riches of “everything” and try not to ask those annoying itty bitty questions about the actual situation. Anyway, I don’t remember having laughed so much at a comment so thanks for that. P.S. Annoyingly (I know, I know) I would still like responses to my original points. David,everything comes to he/she who sits and waits.